Hey all – I recently made a a water powered mill for an adventure I’m running with my local gaming group. 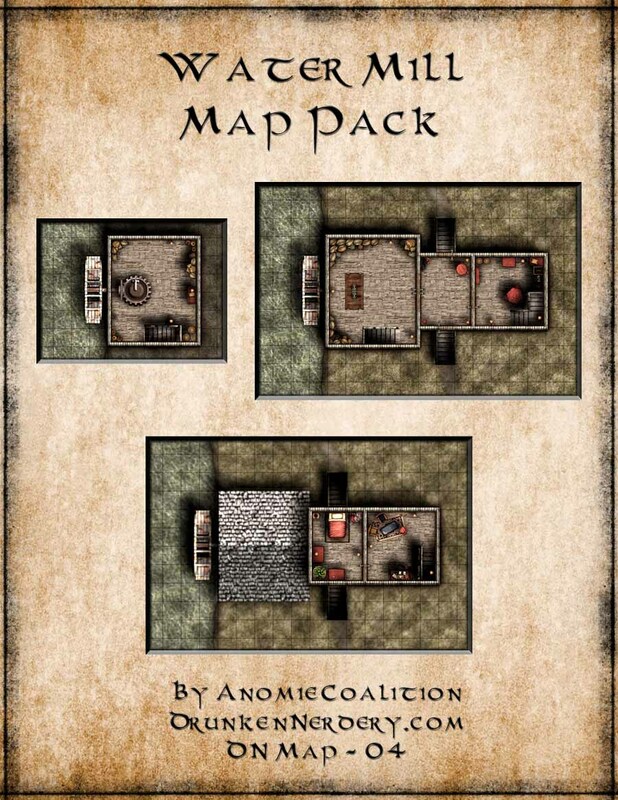 I decided to make it a map pack for sale at DriveThruRPG for only $1. This Map Pack contains: Maps for a water powered mill on the banks of a small river. There is a map for the ground level which contains an entry foyer, kitchen, and warehouse. There is also a second floor map that contains a study and bed chamber. Finally, there is a map of the cellar which contains the actual mill. These maps were drawn at full scale (5’ square = 1”). Each map is provided in .JPG file format to either take to your local print shop or upload to your favorite VTT. Included in the ZIP file is both a scaled and unscaled version of the Ground and Second Floor. I have provided a labeled and unlabeled copy of those unscaled versions. Because of its small size, the cellar map is only provided in scale. Each map is also provided in this PDF for at home printing. There will be a GM map with labels followed by successive pages of scaled images of that map (with the exception of the Cellar). Each page is overlapping &frac;12; inch with successive pages to the right and below the previous page. Print each page as Letter sized in landscape orientation with no adjustments made to scale. After they are printed simply cut away the white border and glue/tape pages together so that the overlapping parts match up for a seamless map. Categories: Uncategorized | Tags: 3.5, Battlemap, D&D, dnd, Encounter, Grain Mill, Mill, Pathfinder, RPG, Water Mill | Permalink.